Asbestos has been found in the Sydney Opera House during renovations and 25 electrical workers may have been exposed. Exposures like this could lead to asbestos-related diseases, including mesothelioma. Occupational asbestos exposure is the most common cause of mesothelioma. Asbestos was recently found during renovations to the Sydney Opera House. The company contracted to do the electrical work failed to notify workers for 5 days that asbestos had been found. In response, the Electrical Trades Union (ETU) advised members to immediately stop working on the project. The Electrical Trades Union (ETU) includes more than 70,000 electricians, apprentices and electrical workers around Australia. Justin Page, assistant secretary of the New South Wales branch of the ETU, was outraged by the discovery. “The union is extremely concerned that, almost a week after tests confirmed the presence of asbestos in work areas, the builder Laing O’Rourke and electrical contractor Downer have failed to undertake adequate risk assessments,” Justin Page said. The asbestos was found during construction of an accessibility tunnel. Fortunately, the asbestos has now been removed from the location and the site has been declared safe. Workers have also undergone health checks. The Sydney Opera House opened for the first time in 1973 after 14 years of construction. Now, it is one of the most iconic buildings in the world and has 8.3 million visitors every year. After 40 years of heavy use, the opera house needs renovations to update the space. The Sydney Opera House renovation is a $200 million project. 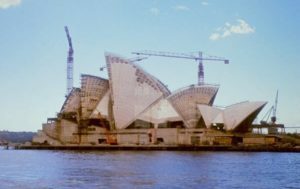 When the opera house was being built, between 1959-1973, asbestos was popular around the world. Construction was one of the main uses for asbestos. A wide variety of construction materials used asbestos because of its versatility and ability to insulate and stay fireproof. Justin Page was disappointed that the building companies didn’t recognize the danger before workers were exposed. “One would expect with the age of the Opera House that asbestos would have been present. What we can’t understand is why the risk assessment did not pick it up and they failed to put adequate safety controls in place,” he said. The electrical workers who were renovating the Sydney Opera House were exposed while doing their job. Unfortunately, occupational asbestos exposure is the cause of most mesothelioma cases. The construction industry is heavily impacted by mesothelioma and other asbestos-related diseases because of the wide use of asbestos is construction materials. When asbestos use was at its peak, many workers were exposed while building new structures. After asbestos use slowed down, many workers were still exposed through repairs and renovations to structures that were built with asbestos. The Electrical Trades Union. Home Page. Retrieved from: http://www.etunational.asn.au/. Accessed: 8/2/17. Sydney Opera House found to have asbestos in wiring, 25 workers exposed: union. The Australian Broadcasting Corporation (ABC). Retrieved from: http://www.abc.net.au/news/2017-08-01/sydney-opera-house-has-asbestos-in-wiring/8764256. Accessed: 8/2/17. Asbestos found at the Sydney Opera House triggers union work ban. 9 News. Retrieved from: http://www.9news.com.au/national/2017/08/01/14/10/asbestos-found-at-the-sydney-opera-house-triggers-union-work-ban. Accessed: 8/2/17. 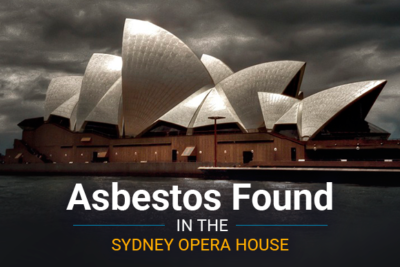 Opera House launches probe into asbestos. 9 News. Retrieved from: http://www.9news.com.au/national/2017/08/03/03/33/demands-for-nation-wide-asbestos-removal. Accessed: 8/3/17. Interesting facts about the Sydney Opera House. The Sydney Opera House. Retrieved from: https://www.sydneyoperahouse.com/our-story/sydney-opera-house-facts.html. Accessed: 8/3/17.